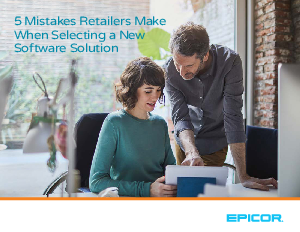 Replacing your point of sale (POS) software can be daunting, and most retailers recognize that innovation is important for delivering on evolving customer expectations. Selecting the right software is an investment of time and money that can pay off with increased customer loyalty, more productive employees, and simpler business management. Not involving the head of the organization in the decision-making process—In a world driven by technology, perhaps no other decision can have a greater impact on your company’s success or failure. The top executive should always be involved in the search for new software by establishing a vision for the project. Skipping the planning phase because it “takes too much time”—The time you invest in planning your vendor selection process will easily pay off before the process is complete. Not documenting your objectives and timelines will certainly result in delay—or possibly derailment—of the project. Considering a technology partner that doesn’t truly understand your industry—In a hyper-competitive retail world, you need a solution provider that understands the nuances of your business and offers a solution capable of meeting your unique needs. Selecting a vendor that lacks a long-term product vision—To understand what the next 10 years will bring for your industry and what impact it will have, look at the last 10 years—then double that rate of change. Make sure that the vendor you select has plans for adapting to the rate of change and for supporting their product long-term. Read the guide to learn more about how these mistakes can cause your organization to stumble—and how you can avoid them.